Spoiler alerts are pretty redundant with things like this, but I think it should be stressed for this one. If for whatever reason you haven’t seen the episode prior to reading this, stop now and go watch it before continuing. Bring me back some soda while you’re gone. Don’t forget to pick up some Starburst while you’re there! Back? Kay. Seriously though, I think this episode lost a lot of the impact it could have had on me, and therefore deserves to be a lot better than it seemed to me, because I had two things spoiled right off the bat due to more IMDBing and image searching than I should have done. First, I knew this wasn’t the end of the series by far, and second, I knew that both Crichton and Rygel would appear in later seasons. Meaning both that I didn’t for a second believe Rygel’s death scene (which, considering that he’s my favorite character, should have been an enormous deal for me), and I knew going in that Crichton would eventually have to not be on Earth by the end of the episode for whatever reason. Compared to Kevin’s girlfriend, who we watched it with and didn’t have either of those answers already… Certain scenes hit her with far more impact, and I’m a little disappointed that I missed out on that. My point is, this isn’t a good one to be spoiled on. Though if you read this far and still hadn’t seen the episode, it’s way too late now anyways. In any case. In addition to seeing Crichton’s frustration continuing to build at the very beginning of the episode, we get an interesting look at where the relationships between him and the others have come to this point. Chiana points out irritatedly that Pilot is stopping the ship specifically for John’s benefit, wondering why he gets to stop the ship on a whim if he isn’t the captain – missing the point that Pilot is doing this by choice, not by command. He knows this is of extreme interest to Crichton, and calls it to his attention. The conversation that follows (both in words and facial expressions) really seems to highlight that for all of Pilot’s talking down of himself that we saw in the earlier episodes of the season, he appears to be feeling more like an equal, at least with John, who has definitely done enough at this point to earn it. Continuing to John’s departure, we see the continuation of what was already explored two episodes back, the fact that the other members of the crew have actually grown pretty close to Crichton, and definitely consider him a member of the team at this point. Everyone (except Chiana, of course) is very sad to see him leave. Even Rygel looks downhearted when Pilot announces that he really is gone. Then we get to Earth. There’s a few brief moments where we, along with John, aren’t completely certain its the right place, but it gets confirmed pretty quickly. This is another episode with an awesome soundtrack to it, but it’s interesting to note that a lot of the scenes on Earth have either no background music or limits it to surreal ambient noise. There are some really nice sounding tracks when there is actual music playing, especially in the scenes between Crichton and his father. Considering the entire thing winds up being a fictional creation, we’ll probably never know more about what was supposedly going on, but I was left wondering just what the fleshed out version of this fake chain of events might have actually been. We’re told that the wormhole John opened at the beginning of the series remained opened after he went through, but not anything else that might have happened in the seven months since. Did a Peacekeeper ship wind up falling through in the opposite direction (which would actually be a very good explanation for why Wilson and the others are so hesitant to believe that Crichton is actually human at first), or did something else come through? It’s probably pretty pointless trying to muse on it, seeing as the creatures that made the illusion may not have even developed it to that extent, but I’m actually pretty interested in what that alternate story could have been. If anything, it might have given a little more context to Wilson and co.’s reactions, throwing a little bit more grey behind the otherwise very black portrayal of the human characters. “Earth, minus the sunshine,” indeed. Getting to hear what the others actually sound like to people without translator microbes was awesome, and I’m very glad that they finally remembered that not everyone has them (considering that every planet the crew has come across up to now, however remote or isolated from the rest of the universe, has had no problem understanding them). Two more points before I stop myself from blabbing and leave things for the others. There’s an interesting bit of role reversal that goes on towards the end with Aeryn. For once, she is the one adjusting to a completely alien place, where the people look like her species but aren’t quite the same. Also, watching the world begin to break down into an almost Lynch-like dreamstate once Crichton finally starts to work out what’s going on is fascinating, if also pretty damn creepy. Oh, man. I’ve been waiting for this one. I completely forgot that it was this early; I thought it was somewhere in Season Two for some reason. Another recycled but wonderfully executed theme of this show is that of outside forces pretending to be human in order to study them – to the extent that they create elaborate constructs in order to continue the illusion. Star Trek does it every once in a while; there are at least two examples that I can think of. It’s a fairly common trope in sci-fi, too; I could spend hours listing all the different places I’ve seen it. It ends up being a bittersweet episode, since it was all a hoax, but it’s a completely honest look at Earth, especially considering how it’s coming from outsiders who don’t know anything about it save what they pull from Crichton’s head. The fact that it is completely realistic only confirms what we already knew; Crichton can’t combine his past life with his present. Earth is one way, and Moya and her crew are another. They’re completely incompatible, and even he knows it; the fact that he doesn’t try to argue when the Ancient pretending to be his father says that they could never go to Earth proves this. He simply asks what Not-The-Father plans on doing next. I hope you’ve been following the way they refer to Crichton thus far. 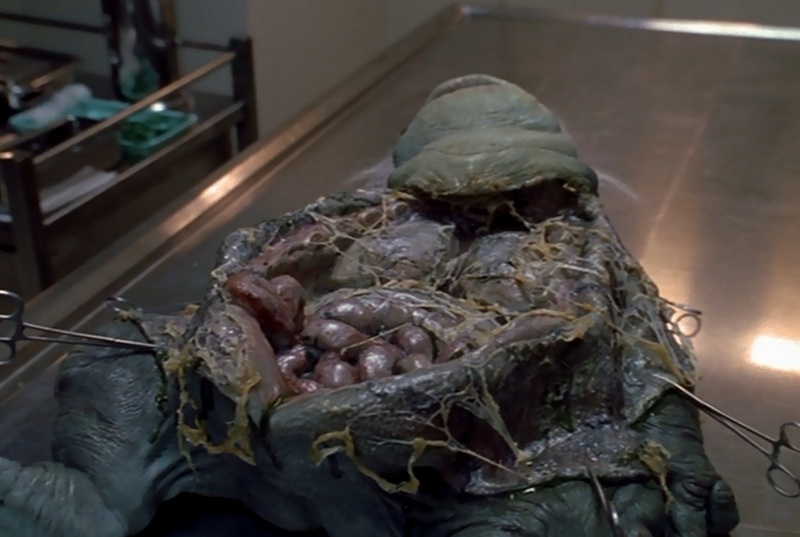 Everyone calls him Crichton when they’re being casual or impolite. The only person to call him John casually thus far has been Zhaan, and she only did it when speaking directly to him. Anytime else, she follows the group and calls him Crichton. Now both Aeryn and D’Argo have called him John at this point, and always during times of emotional bonding. The only people that don’t use his name now are Pilot, Rygel, and Chiana. And I don’t think Rygel respects anyone enough to be polite to them. Pay attention to the music at the end of the cold open, before the opening credits start rolling. 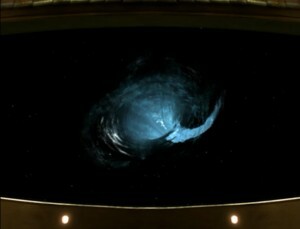 When Crichton recognizes the wormhole, you can hear the main title music – but significantly distorted. The way Crichton confirms his suspicions, that this Earth isn’t real? Best. Thing. Ever. And it’s something that makes the most sense, too. I wonder if Not-The-Father is the only real person in the construct. It’s never stated whether the rest are holograms/robots/whatever, or if they’re likewise the Jar Jar Bugs with access to Alter Self. Speaking of Not-The-Father, I love how he’s a Battle Damage He-Man. I had one of those when I was little. I think I still have it somewhere, too, although the spring is worn out by now. Not an observation of the episode, but of Tessa’s and Trekkiegirl’s reactions to it: They both stated that this early in the show, if Crichton was back on Earth, he wouldn’t be able to stay anyway. I thought this was worth mentioning. Is anybody else with me in feeling that this episode is further proof of just how pointless “Jeremiah Crichton” was? Both start with the alienation of John. There, he flies into an exaggerated tizzy, calls everyone names, and storms off the ship. Here, he has a deeper philosophical moment as he stares at his first grey hair and wonders if his journey home will outlive him. There, he gets stranded in space, only to, by complete random happenstance, come across a world with Earth-like shores, Earth-like people, and Earth-like skies that John must have pushed out of his memory because, just two episodes later, he keeps going on about how much he misses skies. Here, his leaving of the ship happens when a wormhole, opening by what seems like complete random happenstance, shows the tantalizing glimpse of Earth at the base of its sphincter, and all the others (sans a flustered Chiana) wish him their farewells. There, problems arise when John inadvertently steps into tribal politics and a romantic triangle. Here, John’s entire society turns against him, locking him up for a constant barrage of prodding and questioning instead of the homecoming he’d hoped for. There, the others show up in the second half, refusing to leave their buddy behind, only for Rygel to be worshipped as an unfortunate deity. Here, they show up, refusing yadda yadda, only for Rygel to end up on a dissection table. Yes, “Jeremiah Crichton” did have deeper character threads that ultimately made it worthwhile, but break the stories down to their basic mechanics and hold them up side by side. It’s a bit frustrating to get them so close to one another, but I have to say that this is the episode I ultimately found more satisfying, more thought provoking, more crushing. The way all the paranoia and totalitarian scheming comes not from outside influences, but from deeper fears within John himself. The way the others are staring, tears in their eyes, at John’s module disappearing into the wormhole, limited sensor readings refusing to tell them if he made it out the other side. The way John glorifies his father as the only one who will always stand by his side, through thick and thin, while still knowing deep down that the man would be incapable of stopping such opposing forces. “Jeremiah Crichton” was entertaining, but “A Human Reaction” is frelling haunting. It’s a metaphysical journey that forces John to confront his own fears of returning home. He wants, we all want, every other show’s hero would want, his glorious return to be filled with parades and roses and beer with the buddies and high fives from people on the street who are all “Hey, it’s you!” But we know it won’t go that way. Would it go to the extreme we see here, where human forces completely shrug off the consequences of extraterrestrial homicide given that there’s a huge wormhole still hovering in their orbit and news may spread about their actions? Probably not. But it’s still nice that John is being forced to face such an extreme. Going home may be his desire, but it will bring with it its own set of dangers, both for himself and those he cares about, and he needs to be ready to face those dangers should he want to see the journey through. Now, all this said, I do still have some problems. I love the dreamlike atmosphere, the great way John starts seeing through the cracks, even the marvelous direction with all its stylized cuts and just slightly skewed shots and groans on the soundtrack that give life to the strains of this artificial reality…… but wouldn’t it be more interesting if it were real? No, think about it for a moment. How better to catch people off guard in the second half of the season than to have the hero return to his homeworld, only for it to mark him as a pariah, turn him against people he thought were old friends, and have him walk in on the dissection of a new ally? 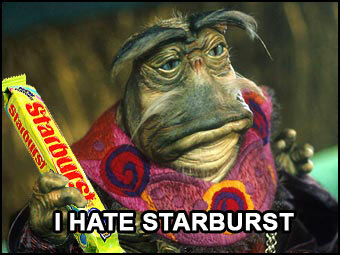 Farscape is a show that’s already started hammering away at the moulds of conventions, so why not push it all the way? I know it’s still early in the series, but this episode, amazing as it is, dangles this little thread of missed opportunity before me, and I wish I could reach out and give a tug. Chiana hasn’t made it into the opening credits yet, and she only has a single scene here, but she’s already causing trouble. This is perfectly normal for her. This episode, combined with “The Flax“, pretty well cements John and Aeryn’s relationship status. Especially after they escape and find shelter in a place that Jack suggested. There is a cut to black, so the actual goings-on are left a little bit ambiguous, but the pair’s reactions the next morning imply that something happened. This gets a call back later. Speaking of call backs, the events of this episode become very, VERY important in the series’ myth arc. There’s no actual foreshadowing in the episode, but it makes sense in context. What you see here is also the first of many choices Crichton has to make between Earth, his birth world and home to his entire species, and the Moya crew – specifically Aeryn. Again, the writers are setting up for the long game. Crichton states, and it’s repeated by others, that he’s been gone for seven months. Just under half of that time was spent chilling out with the orange and purple people. I suppose it strikes me as a little odd that they don’t play a bigger part in John’s impression of the Uncharted Regions. Fashion check! First, a red seatbelt upgrade for the Farscape Module. They look like nylon straps, but they’re better than nothing, and I don’t recall seeing them in “Till the Blood Runs Clear”. Second, Aeryn’s space overalls return. And who doesn’t love space overalls? Third, Wilson’s earrings. There’s just… something eye-catching about them. My love for this episode knows no bounds. For me, it’s so important because it’s the first time Crichton realizes that he may not actually want to go home, because it won’t be home anymore. He’s seen things that no other human has seen, had experiences that no one on Earth can possibly understand. Not only will Earth seem small to him, but that it’s people would react badly to Crichton or his friends isn’t something he’d considered before. This is the episode that made me realize Farscape was great. It’s an absolutely gorgeous episode; I agree with you, it’s probably one of the most striking of the entire series. I agree with you; it’s from this moment on that Crichton, while continuing his search for home, may not entirely want to go back there anymore – at least not nearly as much as he thinks he does. He’s more at home with these unknown species than the planet he grew up on. Noel, he misses the skies because he spends most of his time in deep space. Sure, he took a quarter-cycle leave with Barbados Slim, but that’s still less than half of his time away from home. Moya has no sunrise or sunset, and since she’s not a military ship, there’s probably no standardized “Shipboard Time”; part of the reason Rygel keeps walking in on Zhaan naked. Until the next episode, there’s no example of shared meals or any other kind of timekeeping schedule; everyone wanders about on their own until there’s an emergency or when they drop into some planet’s orbit. Yes, Kevin, I fully understand why he misses skies, I just thought it was a bit sloppy to place this so close behind an episode where he spent three months beneath them. One could argue that the reminder of skies made him miss them even more, but I wish they’d played that up a little. As it is, it feels like they’re trying to sweep “Jeremiah Crichton” under the rug. Not that I blame them. As you pointed out, the people who made the show aren’t fans of it, either.